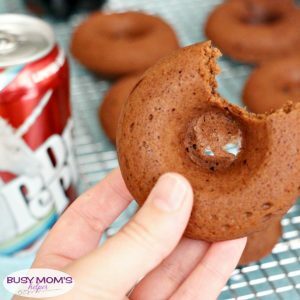 Back to school time is upon us, meaning we’re stocking up on easy breakfast ideas as well as after school snack options. 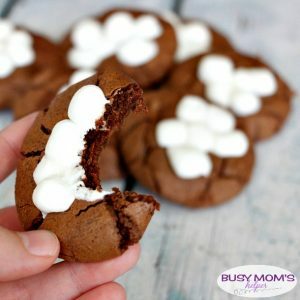 You want something easy, portable and that the kids will love. 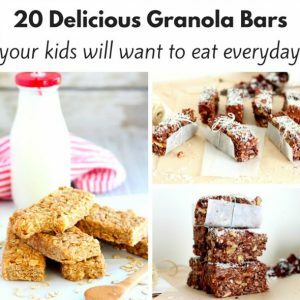 These 20 Delicious Granola Bar Recipes are perfect, and may have your kids asking for more every day! 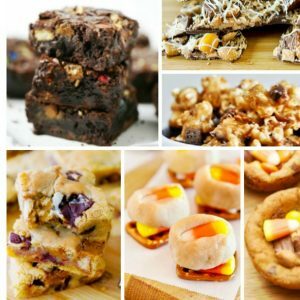 You’ve got very chocolaty options, peanut butter, pumpkin, cranberry and many more to choose from with all these granola bar recipes. 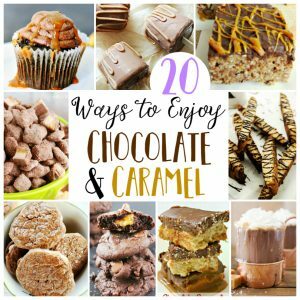 Heck, there’s even several I want to whip up for MY afternoon snack! What’s YOUR kid’s favorite type of granola bar? My kids are BIG fruit lovers. They’ve been that way since baby-hood, and I don’t see it changing. I’m definitely happy about that, and try to fit in more fruits into their meals and treats. 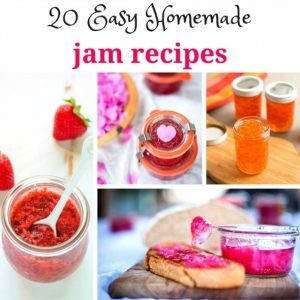 One thing they really enjoy are homemade fruit roll-ups, using a variety of fruits – usually whatever I find on the best sale that time of year! 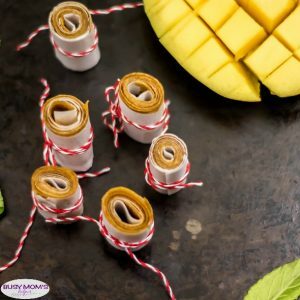 These Homemade Mango Roll-Ups are a huge hit, and I love having them on-hand for busy after school days. We’ve done strawberry, raspberry, even apple before and they’ve all tasted so great – and as a mom, I love that they’re a healthy back to school snack option. 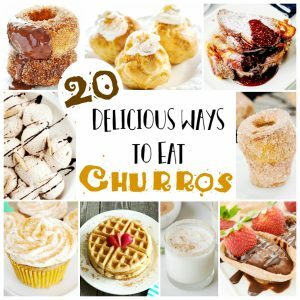 As a bonus, they’re easy to take along as we’re running to all of our activities and errands! Preheat oven to 200 F. Line a half sheet pan with silicon liner or parchment paper. Blend the mangoes in a blender till it becomes a smooth puree. Dump the mango puree on the prepared baking sheet. Spread it as thinly as possible with an off-set spatula. Bake the mango puree for 4 hours. It will be done when the mango purée is dry to the touch and pliable. Remove the roll-ups from the oven. 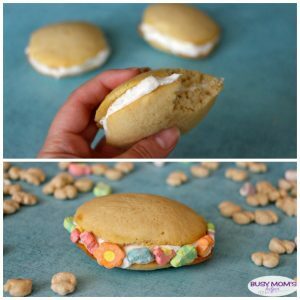 Place a piece of parchment paper on top of the roll-ups and then peel off the parchment and the roll-ups together. Cut the sheet into long strips and then roll up the strips. baking, flip the roll-ups over and continue baking till they are fully dried up. The fruit roll-ups will last for about 1 week when stored in an air-tight container. 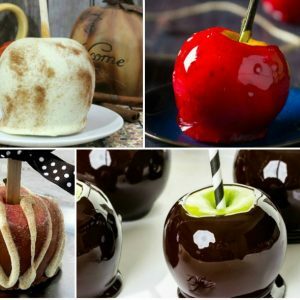 What fruit would YOUR kiddos like best? I love starting the day with a delicious, flavorful breakfast – and smoothie bowl recipes are some of my favorite! Not only are they often a healthier option, but they taste great AND look beautiful. 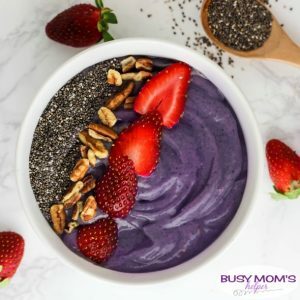 This Very Berry Smoothie Bowl is no exception, and you can whip it up for breakfast or a quick snack super quick! I recommend having access to a really good blender, so your smoothie is really smooth and creamy. Then your toppings can add texture as you see fit. I’m not a fan of clumpy smoothies, so I blend mine extra good then top it with fruits and nuts and such. It’s also nice to go with what mixed berries are in season for the best flavor AND price! 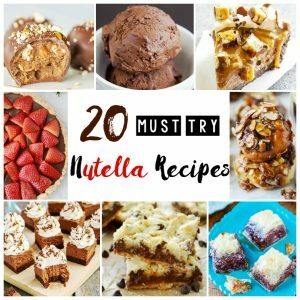 Place all ingredients, except toppings, into a blender. Divide into 2 bowls and top with desired toppings. What flavor of smoothie bowl is YOUR favorite?